Light Grey Hampshire FD30 Fire Door. Sleek modern style with crisp, clean lines. Seven horizontal panels, vertical borders. Engineered, Hardwood, solid core (weight 45kg). Light Grey Hampshire FD30 Fire Door. This Fire Door version of the Hampshire door is fire rated for 30 minutes where extra protection may be required. 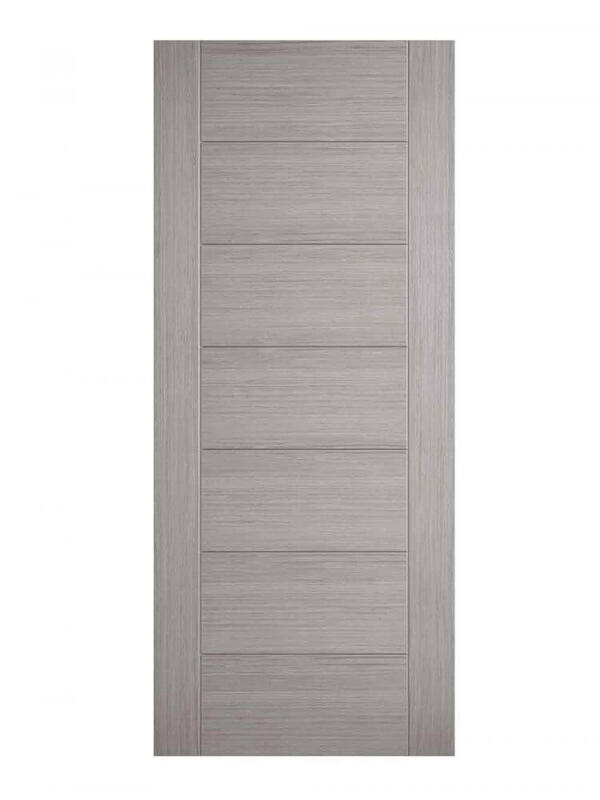 This internal door has sleek style with crisp, clean lines and a simple yet enduringly elegant appeal. This internal semi-solid door is suitable for any and all areas of the home including dining room, living room, bedrooms and bathrooms. The Light Grey Hampshire has five horizontal, rectangular panels surrounded on all sides by a distinctive V-groove. A pre-finished, manufactured door featuring two layers of 10mm hardwood lippings over a semi-solid core. Pre-finished it requires no further treatment and is ready to hang. It comes with a manufacturer’s 10-year warranty. Adjustments can be made on all sides up to the 3mm into the lipping to make it a perfect fit for new and existing door frames. Trimming should not exceed 3mm as this invalidates the fire certificate. Hinges and door handles are not included. We recommend a minimum of four hinges for this door. This Fire Door achieves a fire safety rating of 30 minutes for areas requiring a greater level of protection – specialist advice should be sought on which areas require fire doors; your architect or local building control officer should be able to help.